Subscribe to our newsletter to be notified when a new bengal kitten is available. Take a look at our currently available bengal kittens. Continue your visit and learn more about the charcoal Bengal cat. Subscribe to our newsletter to be notified when new kittens are available. The charcoal Bengal cat has a unique appearance that seduces everyone on his path. Much darker than a standard Bengal cat, we quickly notice his “Zorro markings” on his face which gives us the impression of a mask, as well as a darker cape on his back. The intensity of the mask and the cape varies according to each charcoal Bengal cat. His rosettes are also different; they are filled with black ink instead of being outlined and empty. The charcoal Bengal cat is really special, because just like the Bengal cat breed, he owes his existence to both the domestic cat and the Asian leopard. For a Bengal cat to be charcoal, he must have received the melanistic gene (a) from the domestic cat and the gene (Apb) from the Asian leopard. Strangely, these 2 different felines had complementary genes that when combined together, produces exceptional results. Charcoal Bengal cats in all colors! 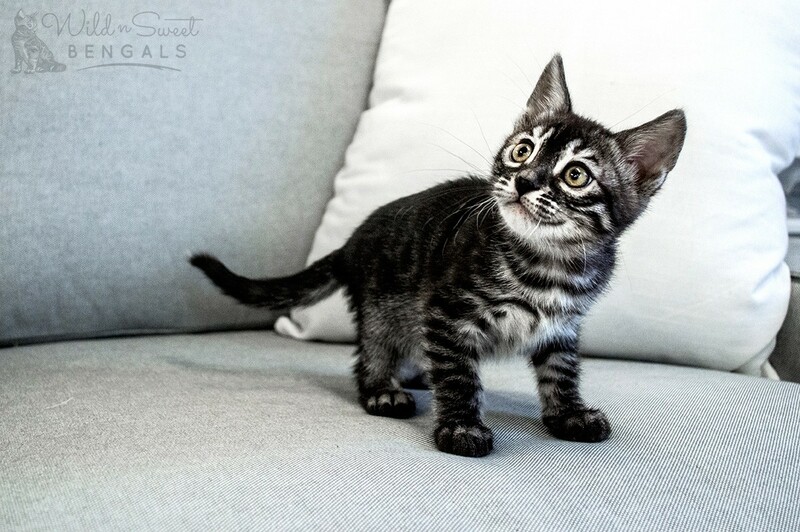 Wild N Sweet Bengals is one of the few catteries in the world that produces charcoal Bengal kittens in brown charcoal, silver charcoal and even very soon in the snow charcoal coloring! The brown charcoal Bengal cat looks nothing like a traditional brown. The charcoal makes the brown color much darker to make a coat that is between gray and brown with completely black patterns. The silver charcoal Bengal cat looks like brown charcoal, but with a lighter background color in shades of white or gray. The silver color gene whitens the background of the coat, the belly as well as the facial traits. The silver charcoal Bengal cat often has a sensational appearance. The blue charcoal is the rarest color of all charcoal variations in the Bengal cat breed. Combining these two genes is very difficult because there are only a few breeders who work the charcoal color genetic and even less with the blue one. This color is darker than a standard blue, but the charcoal effect is less visible than in brown charcoal or silver charcoal due to the blue (dilute) gene that comes into play. The snow charcoal Bengal cat looks like a snow but with a darker color, a mask and a cape. His color varies depending on whether he is snow lynx, mink or sepia charcoal, the charcoal snow lynx being the lightest and sepia charcoal being the darkest. Generally, the snow charcoal Bengal cat is born very light and will develop darker charcoal markings as he grows. How to differentiate a charcoal Bengal kitten from a melanistic, silver smoke and solid snow? Sometimes you can confound a charcoal Bengal kitten with a melanistic, silver smoke or solid snow. To tell the difference, you must look at the face near the eyes. The charcoal Bengal cat is the only one with markings that looks like white glasses. 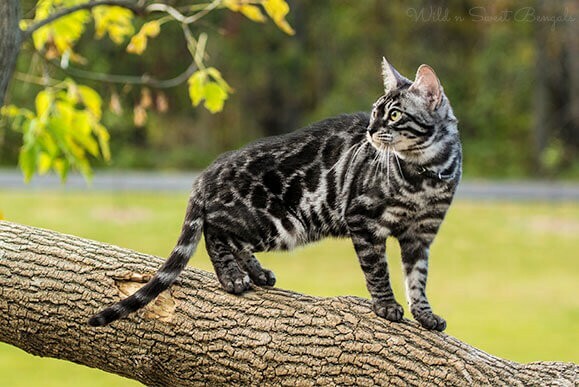 Also, the charcoal Bengal cat will have a lighter background color than his pattern, while the melanistic, silver smoke and solid snow Bengals will rather have a ‘’ghost’’ pattern practically the same color as his coats. How to produce charcoal Bengal kittens? Charcoal Bengal kittens are a little more complicated to produce than the other colors because they need 2 different genes: melanistic (a) and charcoal (Apb). In addition, these 2 genes are recessive, which means that they must each come from a different parent. So for a Bengal kitten to be charcoal (genetically identified Apb/a), he must have received the Apb gene from one of his parents AND the melanistic gene (a) from the other parent. If he receives only the Apb gene, which is often called the charcoal gene, he will NOT be considered a charcoal Bengal cat. He carries only the Apb gene and will have the ability to produce charcoal Bengal kittens. In appearance, he looks like a standard Bengal cat, but often with a colder color and a superb contrast! There is also the double charcoal carrier Bengal cat (Apb / Apb). At birth, he is almost always taken for a charcoal since they look so much alike. Growing up, he becomes a little lighter but just as beautiful. Note that 2 charcoal Bengal cats together can produce charcoal, melanistic (all black) and double charcoal kittens. The charcoal Bengal cat … a little, a lot, passionately!